By using the barren Atacama Desert in Chile as a stand-in for Mars, researchers have shown that it’s possible to use an autonomous rover-mounted drill to detect life beneath a desolate surface. Encouragingly, the test resulted in the discovery of a resilient microorganism – exactly the kind of creature that could lurk deep beneath the Martian surface. New research published today in Frontiers in Microbiology describes a trial NASA rover mission in Chile’s Atacama Desert that could mirror a future mission to Mars. The experimental rover and drill, designed by Carnegie Mellon’s Robotics Institute and funded by NASA, successfully recovered microorganisms beneath the surface – specifically, a hardy, salt-resistant bacteria. The test provided justification for a life-hunting mission to Mars, but the experiment was not without its challenges and limitations. As the new research showed, finding life on Mars – if it even exists – will require some serious technological innovations, a lot of cash, and a bit of luck. Billions of years ago, Mars featured a temperate climate and liquid water at its surface, providing a potential environment for life to emerge. Today, life is unlikely to exist at the surface. Lethal levels of radiation bathe the Red Planet, and its tortured surface contains scant traces of liquid water. During the Martian summer, daytime temperatures near the equator can reach a balmy 68 degrees Fahrenheit (20 degrees Celsius), but at night drop to a frighteningly cold -148 degrees F (-100 degrees C). The rover’s robotic drill in use at the Atacama Desert. Conditions beneath the surface are a different story, according to Stephen Pointing, a researcher at Yale-NUS College in Singapore and the lead author of the new study. Just below the surface, rocks and sediment provide shelter from the extreme conditions above, providing a potential habitat for life. As Pointing explained to Gizmodo, there’s no place on Earth quite like the surface of Mars, but the ground beneath the Atacama Desert in Chile offers a decent analogue. For the experiment, Pointing and his colleagues deployed an autonomous four-wheeled rover equipped with a robotic drill, which successfully recovered subsurface sediment samples from a depth of 80 centimetres (31 inches). The researchers compared samples recovered by the rover to samples collected by hand. Then, using DNA sequencing, Pointing and his colleagues showed that bacterial life in the sediments recovered by both methods were similar, showing that the rover technique was a success. Nevertheless, the new study is the first to show that microorganisms are distributed within specific subsurface habitable zones beneath the surface of the Atacama Desert. Excitingly, the new research shows that the subsurface of Atacama can support highly specialised microbes that could potentially survive the salty Martian soil. Moreover, Mars is known to contain copious amounts of methane at the surface, pointing to the possible presence of methane-gobbling microorganisms beneath the Martian surface, according to the new paper. An important next step for Pointing and his team will be to figure out how the subsurface microbes at Atacama are able to survive. To that end, they’re looking at possible strategies used by the bacteria to survive long periods without water and exposure to extremely salty conditions. 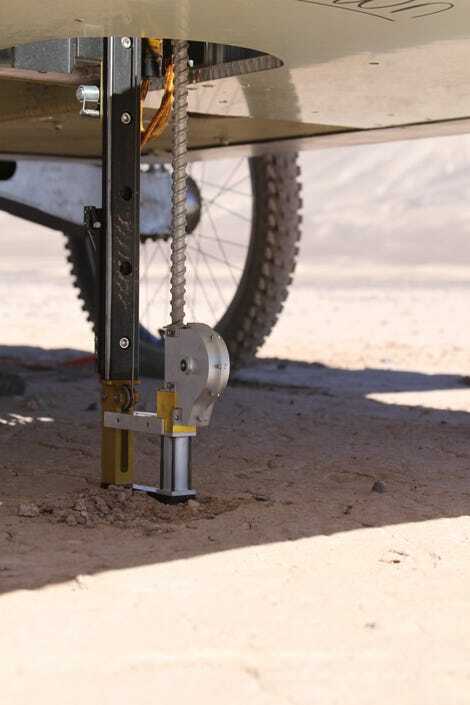 In addition, the team would like to return to the Atacama Desert with a rover capable of drilling 2 meters (6 feet) down. With all this said, it’s time for some reality checks. The researchers successfully used a probe to detect life on Earth, which is admittedly not terribly difficult, even when the environment happens to be a desert. Life has flourished on Earth for billions of years, and it’s ubiquitous, even appearing in rock thousands of feet beneath the surface. Yes, the new research was done at a Mars-like place, but it’s still not Mars. At best, the new study presents scientific justification for a future life-hunting mission to the Red Planet, but any speculation about extant life on Mars remains just that. Another important limitation of the new research is that the sediment samples were tested in a lab, and not by equipment on the rover itself. Pointing himself admitted this will present a major obstacle for Mars mission planners. In other words, it would make more sense for a future rover to search for biosignatures – the remnants of biological life, such as inexplicable traces of molecular oxygen combined with methane, accumulated piles of microbes (stromatolites), and traces of fossilised waste, fat, and steroids. If anything like this could be detected, “then we would need new experimental techniques to test if any Martian bacteria were actually alive and capable of active metabolism,” said Pointing. Lastly, and perhaps more discouragingly, there is the cost of sending such a mission to Mars. NASA and ESA are planning to send rovers to Mars within the next few years, but it’s not clear if either agency has the technological capacity or funds to organise a mission capable of returning Martian rock and soil samples to Earth for analysis. As SpaceNews reported just this week, NASA is unlikely to return Mars samples in the 2020s, primarily due to the expense. Pointing admitted that a return mission would be expensive, costing hundreds of millions of dollars.